The Bendigo Bank Cats have finalised their 2019 playing list, comprising of 24 VFL listed players and 12 development listed players. There are a host of familiar names, as well as some fresh faces from local and surrounding areas. The GFL is well represented, while there are also a host of names from the Hampden Football League and the Goulburn Valley Football League among others. The Geelong VFL program gives local footballers a platform to showcase their ability in Victoria’s premier competition and further improve themselves in a professional environment. The profound impact that the VFL pathway can have on a player is evident through the likes of Tom Stewart, Ryan Abbott and Tom Atkins transitioning from local footballers to AFL listed players through the VFL pathway. One of the most notable new names on the VFL list is Aaron Black, who will lead the side as one of the Cats’ co-captains in 2019. Following stints with North Melbourne and Geelong’s AFL side, Black brings a wealth of senior football experience to the role and this opportunity allows him to continue living and playing with the Geelong Football Club. Joining Black in a new look VFL defensive unit is key defender Kyle Reid who is a welcome addition to the squad after a strong 2018 season with Gippsland Power and Vic Country. Reid was named in the TAC Cup Team of the Year, as was fellow new Cat Charlie Wilson. The GVFL has provided the Cats with some new talent in 2019 with Shepparton premiership duo Nik Rokahr and Luke Smith signing on, as well as Echuca forward Angus Byrne. The Cats have also bolstered their list with local talent, as Newtown’s Alex Cincotta and Colac’s Adam Garner get their first taste of VFL football. As well as the numerous new additions to the squad, a large number of players from the 2018 list have been retained. VFL stalwart James Tsitas was recently announced as co-captain and along with Aaron Black, will lead the new look squad in 2019. They will be supported by a leadership group comprising of returning players Jordan Keras, Campbell Floyd and Dean Gore. Gore missed the entire 2018 campaign through injury, as did teammates Dan Capiron and Cooper Jones, but all three will get another chance with the Cats in 2019. GFL premiers St. Joseph’s are well represented as Keras and Capiron are joined by Jackson McLachlan, Cal Mitchell, Curtis McCarthy and Ben Reid, all familiar faces in the VFL squad. Fellow 2018 GFL grand finalists St. Mary’s are represented by Jack Blood and Pat Dowling. Colac duo Ethan Floyd and Zach Zdybel will remain on the Cats’ list, as will Koroit’s James Gow and Newtown’s Mitch Diamond. Kyle O’Connor, Will Sexton, Tom Lang and Lachie Noble will all be retained on the VFL development list and will be joined by some of the region’s best young talent. Nic Hutchison (St. Joseph’s) Jarrod Korewha (Koroit), Dan Frampton (Red Hill), and Harrison Ling (St. Mary’s) will be joined by Newtown quartet Ned Harris, Baxter Mensch, Zane Keighran and Brayden Helyar on the development list. 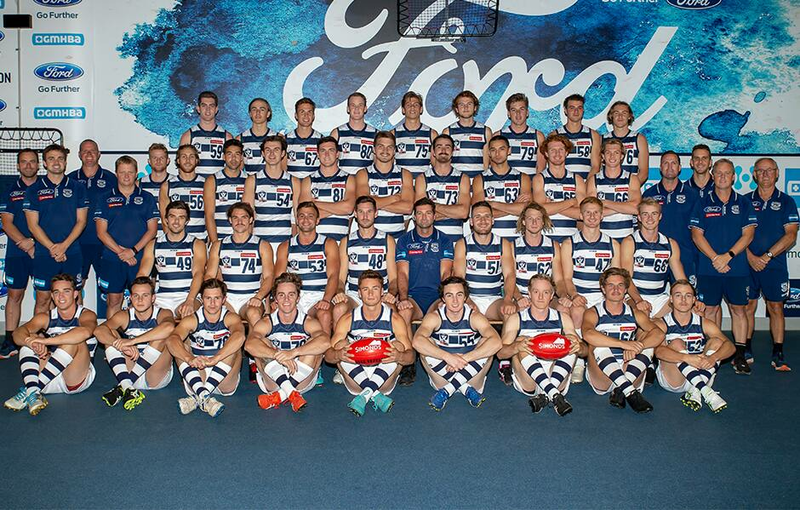 Geelong will open their season against Richmond at GMHBA Stadium on Friday night from 7.30pm. In a new offering for Cats supporters, you can listen to the match live via the goFooty.live player on the VFL Hub.